Now, that spring is well underway and we feel like we are into summer I made some changes on the front door. 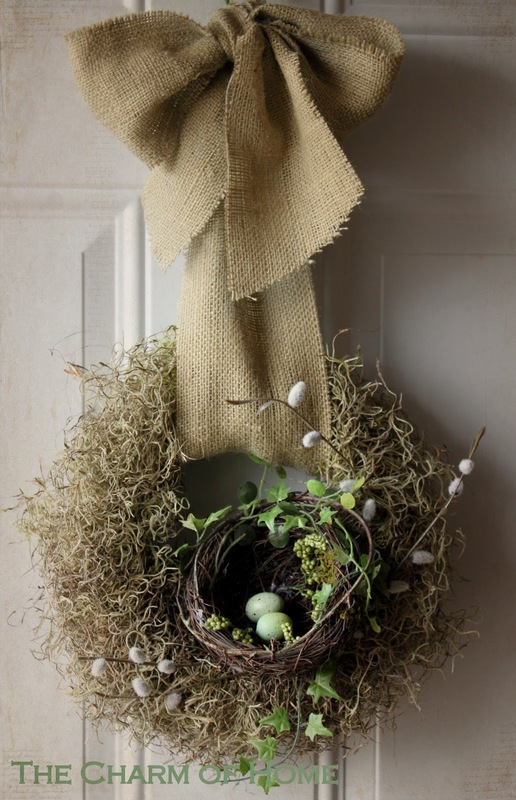 I changed the nest wreath to a fern wreath. I first took a 6 ft. artificial fern garland I purchased at a craft store and a 12-inch grapevine wreath. I clipped the garland to fit the wreath with my tin snips. I used a burlap ribbon left over from Christmas decorations and fashioned a bow. I used a pipe cleaner and created a hanger. Here is the finished wreath. You can shape the ferns as desired. The wreath looks really nice on the front door because the front walk is lined with ferns this time of year. That is gorgeous, Sherry, and it looks relatively easy to make. Thanks for sharing! Sherry, this is a great idea. It looks wonderful. Actually both of these looks make me smile. You inspire me to try to find something for our front door. Lovely work, me like *smile*. Hi Sherry! This is so pretty and delicate looking. Thanks for sharing with us how you did it! Very pretty Sherry! I love them both! I absolutely love this Sherry! I love this wreath! I have the stuff to make it and now I am inspired to get to it! It's an even better combination than I was thinking of! Thanks for posting! I really like this -- it's so clean and crisp looking and great because you can leave it up all summer as is or add to it -- love the burlap too. This is stunning and so simple. I'm going this week and try to find a fern garland! I love the natural look of you wreath, Sherry ~ very pretty. Using the cleaner for a hanger is a great tip too ~ I'll have to remember that one! Oh I love it, Sherry! I'm going to have to make my own! Very, very spring appropriate....and easy to made , Sherry. Thank you for the idea! Oh so very lovely. I love the green and it's spring look. As always your photos are superb. Love your fern wreath, Sherry! I think it's the perfect touch for a Summer wreath! This is so perfect for summer..and I love your pretty burlap bow..it is wonderful. Have a great week ahead.. This is Ann from 'Christ in the Clouds' blog about winning a contest. I sent you an email, but am not sure if you received it or not. Please write to my email at apop12341@hotmail.com if you didn't not receive that email. Love it - do you think it will last long? I love the simplicity of the green ferns with burlap...just lovely! This looks really great..I need to make a new one, too. I love it, so simple so pretty. It looks lovely on your front door. Very naturally welcoming. Thanks for sharing your creative inspiration at Sunday's Best.